Porcine Reproductive and Respiratory Syndrome (PRRS) is a viral disease that, with an annual cost of $664 million, is the most costly disease for the U.S. swine industry. Recent work has identified genomic regions in the pig with strong effects on PRRS. 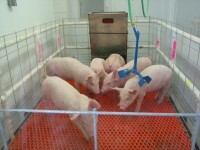 These findings offer opportunities to select pigs that are less susceptible to PRRS, but they are based on experimental infection in clean facilities using clean pigs and with a specific virus strain. This project focuses on further development and validation of these findings under field-type conditions. This project is studying alternative housing systems for laying hens in Iowa — the leading egg-producing state — and California — where cage egg operation will essentially be banned by 2015. The research will include the evaluation of an alternative hen-housing system in terms of bird welfare and health, indoor air quality, air emissions, thermal comfort, energy use, heat and moisture production and hen performance. 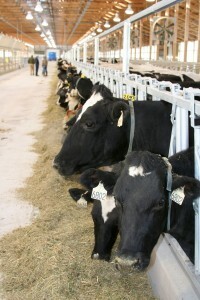 Mastitis is the most costly dairy cattle disease, with losses of $2 billion dollars a year. It results in lost milk production and reduces milk quality, processing characteristics and dairy product quality. This project seeks to assess and characterize both host and bacterial mechanisms associated with mastitis susceptibility and resistance, and develop and/or evaluate and apply new technologies to control mastitis and maximize milk quality and dairy food safety. This project is designed to identify genetic, biological and nutritional factors that influence feed efficiency in beef cattle. Researchers seek to identify genetic factors that could be selected for or manipulated to produce more beef with fewer resources. Information to improve feed efficiency and lessen the use of resources will be shared in extension publications and during producer field days to help beef producers meet the protein needs of a rapidly growing world. This project will develop models of each animal industry that describe its cumulative ecological risk, energy flows or ecological footprint, with the intent of producing strategies and tactics to reduce environmental pollution from confined animal feeding operations. The study will include management tools, strategies and systems for land application of animal manures and effluents that optimize efficient, environmentally friendly utilization of nutrients compatible with land and water quality; treatment processes in engineered and natural systems for management of wastes; practices to reduce odors, gases, airborne microflora, particulate matter and other airborne emissions from animal production systems; and feeding systems to alter the excretion of environmentally-sensitive nutrients by livestock. Feed represents 55 to 60 percent of the cost of raising a pig to market. The improved understanding of the biology of pigs selected for better feed efficiency will identify new technologies and improved management procedures that can be applied by the U.S. pork industry. This research will help to identify metabolic pathways that are important for the efficient use of feed for meat production. An extension effort will ensure discoveries are presented to the pork industry.